Can’t seem to control your dog’s fleas? Unfortunately, it’s not uncommon for fleas to develop a resistance to traditional treatment/preventative medicines. So even if the medicine originally worked, it may lose its ability to ward off fleas later down the road. However, a safe and effective alternative is to teach your dog to swim. How can swimming eliminate fleas? Well, it’s simple: when a dog paddles its way into a lake, any fleas on their coat will drown. The cool refreshing feeling of the water will also alleviate some of the discomfort associated with the flea bites. Some dogs are naturally born to enjoy the water. When you take them to a lake or pond, they’ll jump right in without hesitation and start swimming like they’ve been it for years. However, not all dogs all dogs have this ability hard-wired into their characteristics. If your dog backs away from water instead of jumping in, you may have to put a little bit of extra effort into your training techniques to teach them how to swim. It’s important to note that certain dogs have been bred for hundreds of years with the sole purpose of swimming in the water. One such dog breed, the Labrador Retriever, is now the most popular type of dog in the U.S. In the past, labs were used primarily as hunting companions for retrieving ducks and wild fowl in bodies of water. Once the hunter shot down a bird, the lab would swim out and retrieve it. While they’re still used for this purpose today, most families own labs because of their loving behavior. If you want to teach your dog how to swim, you have to start small. Don’t force them swim in a large lake or pond, but instead start in a swimming pool. This smaller area will allow your dog to feel more comfortable and safe trying to perform a task they are unfamiliar with. When you’re ready to start teaching your dog the basics of swimming, place them in the shallow area of the pool while gently holding them up. If your dog is frantically trying to get out, reassure them that everything is okay and there’s nothing to be afraid of. Dogs who’ve never been in the water may get frightened when they encounter it for the first time. The most effective way for teaching a dog to swim is to allow them them to come to you. When the two of you are in the pool, slowly let go of your dog and back away a few feet. They will naturally try to swim back to you by rapidly moving their paws. When your dog reaches you, give them lots of love and praise by telling them how good they are. Continue doing this for about 15 to 25 minutes or until your dog gets tired. 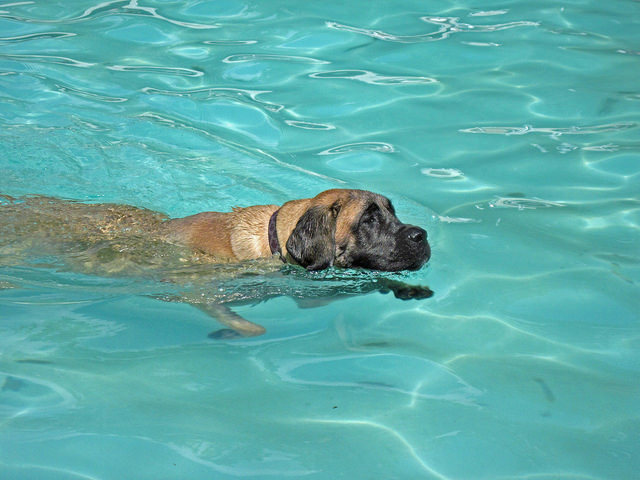 When you think your dog is ready for some serious swimming, take them to a local lake or pond. Once there, find a clear beach area for the two of you to get in and see if they will swim. You can even try to play fetch with your dog by throwing a stick or tennis ball a little ways out.